Capture more than the moment - capture the experience. Verbatim Pro 600X microSDXC Memory Cards provide the speed, capacity and quality to capture all of life's adventures in incredible detail. With a UHS-I interface and U3 speed class rating, these high-speed cards ensure you never miss a moment. Designed to keep your memories safe - Verbatim Pro microSDXC cards are waterproof, shock proof and temperature proof. Featuring extended capacities - 64GB and up, microSDXC cards let you store more memories, and read speeds up to 90MB/s allow you to capture 4K video without worry, and enjoy smooth playback and transfer files with ease. 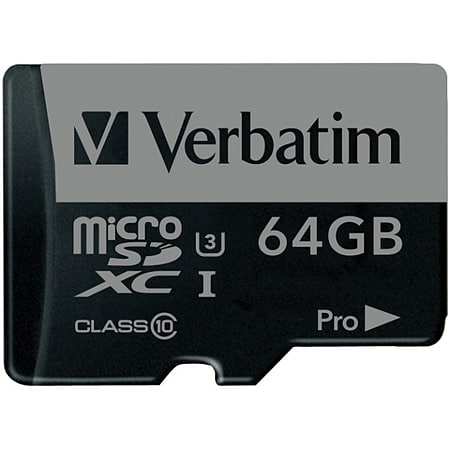 Verbatim Pro microSDXC are perfect for use with action cameras and by professionals or enthusiasts alike. Backed by a Limited Lifetime Warranty, Verbatim Pro microSDXC cards are technology you can trust.